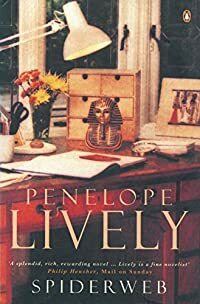 Spiderweb by Penelope Lively was first published in 1998. I’ve read quite a lot of her books in the past couple of years and enjoyed them all, but although I liked this one for me somehow it lacked something, so I was a wee bit disappointed by it. It begins with Stella Brentwood settling down in rural Somerset, she has bought her first home and is putting down roots, something she has avoided in the past, which is ironic really because her entire life has been taken up with anthropology, studying how other people live in more exotic areas of the world. She has always been an outsider but even as a student she never hankered after a husband and children, unlike her friend Nadine who had her future family life all planned out. Stella’s closest neighbours are a bit of a problem family. Mrs Hiscox is a bully who is only happy when she’s raging at someone, so she rages all the time and her young teenage sons and her husband sigh with relief when she takes her bad temper outside the family. Stella is still observing human nature, just as she did in her career. When other people want more of Stella in their lives than she’s willing to give she realises that she has made a mistake settling down. There’s obviously a lot more to it than I’ve written and as you would expect there are some great observations on human character, but I think that Stella’s detachment from society, colleagues and friends was a problem for me.